Trying out system 3 acrylics for a portrait exercise. They are fluid and soft. I expected an extremely quick drying time on the palette but surprisingly stayed wet for a time enough. Cryla are obviously thicker and meatier. I don’t know if I have a preference of one over the other. I do know I will always prefer oils! The portrait is one I will use as an example for a workshop with some Higher Art students at Auchenharvie school tomorrow. 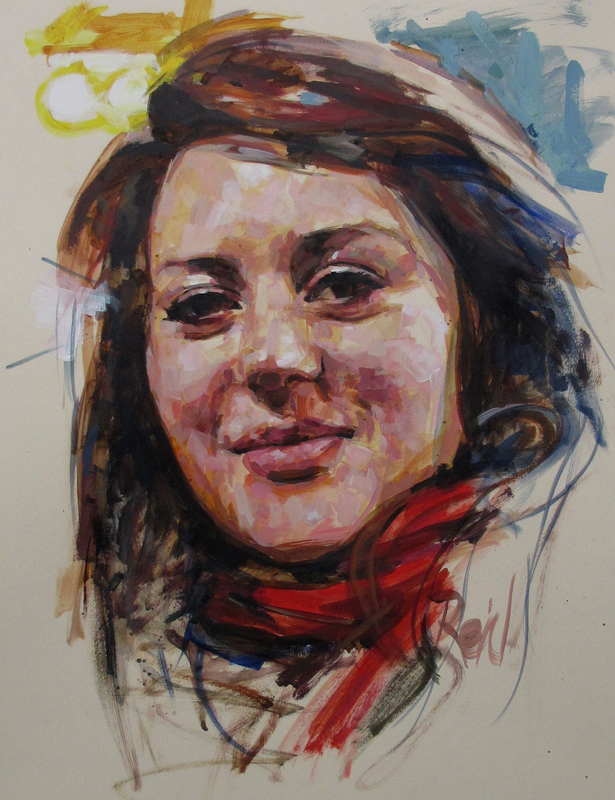 This entry was posted in Uncategorized and tagged acrylic, Art, art demonstration, art in schools, portrait, system 3 by David Reid. Bookmark the permalink. Thanks Willie. I met Kenny last time, he is in the workshop group and he gave me a lift home! So I will definitely pass on your best. Very impressive. Your technique is so accomplished. Thank you Rosie, very kind. I never got to take enough painting classes to get the right feel for working in oils, so have always fallen back on acrylics. Someday, perhaps! Right now I’m getting the itch to do some very simple monochrome or narrow range washes over graphite, and hope I can find time soon. This is so lovely that it should get me in motion at the least! Thank you , Kathryn. Oils are less difficult than you probably think. Get stuck in! But I agree, time is the enemy. Wow, really beautiful and inspiring to see what you can create with spots of colour and very little blending. Thanks for sharing.